If you heard Carlos Capdevila's story out of context, you might be forgiven for thinking that it was the plot to a major Hollywood drama. In his life, Mr. Capdevila has overcome enormous adversity in order to become that special, one-in-a-million success that defines the American dream. Born in Tucuman, Argentina, Capdevila's primary interests as a young man revolved around his place as a drummer in a popular Argentinean rock band. For eleven years, 1974-85, Capdevila toured with this band (and as recently as 2009, he played live shows with the Sean Costanza Band). 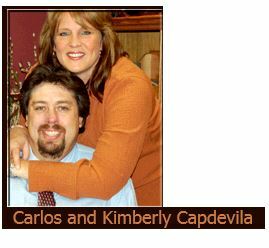 Carlos changed his wild and wooly ways shortly after meeting Kimberly Johnson, the woman who would become his wife. The couple married in 1981, and lived in Carlos' native country of Argentina for four years. After the birth of their first child, Lindsey, the Capdevilas traveled to Burlington, Iowa to raise their daughter. This relocation posed a series of challenges for the young Carlos Capdevila. First, up to this point, Carlos had communicated with others, including his wife, almost exclusively in Spanish, so he had to learn an entirely new language just to be able to interact with others. Second, Carlos' primary job skills were centered around being a professional musician, to find a new job that could support his family, Carlos would have to learn a new set of skills in a short amount of time. When asked about how he chose a career, Carlos told The Hawk Eye (a newspaper from Burlington, IA) that "when you have a 4-month-old baby and $50 you don't pick." Carlos knew that he had to find work, any work at all to support his loved ones. Thankfully for Carlos, and eventually American Family Insurance, Carlos found his footing in the insurance trade. Despite the language barrier Carlos faced, despite the short amount of time he had to learn everything that he could about the insurance trade, Carlos was able to persevere. Did he pass the test on the first try? No, in fact, for many state insurance exams, half of the first-time applicants fail. What makes Carlos such a great man is what he didn't do: give up. When things got tough, Carlos redoubled his efforts, spending his nights translating his study material so that he could understand it better, and he kept going back until he passed that insurance exam. Carlos' first insurance job came from Combined Insurance. At this time, Capdevila was not a fluent English-speaker, and his wife helped him memorize his sales call script. As Capdevila reminisces, "I didn't understand what I was saying." Despite this barrier, Capdevila quickly rose to the top of Combined Insurance's list of salesmen in just one year. During this time, he diligently worked with various members of different Iowa communities and farmsteads to build his command of English. Capdevila eventually moved on from Combined Insurance to work for the American Automobile Association, or AAA, as it may be better known. He started out by going door-to-door for the automotive service giant, but was soon promoted to working over-the-phone sales. Capdevila's next fateful career move was, ironically, started because of a coworker who was looking to find a new job. When the recruiter from AFI (American Family Insurance) saw Carlos' sales numbers, Capdevila ended up getting recruited in place of the coworker who originally applied. After this fateful encounter, Carlos became an independent contractor for AFI with his own fledgling insurance agency. In the beginning, Carlos' experience with door-to-door sales from his time with AAA proved to be useful as he sought to establish himself as an AFI affiliated agent. Carlos' first big break came in 1992, just seven years after moving to Burlington, IA. This was the year that Carlos brokered a deal with the owner of a Domino's franchise to provide complete coverage for their business. Carlos' program so impressed Domino's franchise holders that he expanded his list of contracts with the company until it became a six million dollar account. Beyond being an excellent businessman, Capdevila is a dedicated humanitarian. After the events of hurricane Katrina, Carlos helped establish a relief effort with a Domino's franchisee that fed survivors of the disaster. When others needed help and comfort in a time of need, Mr. Capdevila was there to provide comfort and much-needed aid. To help celebrate his article in The Hawk Eye, Carlos recently commissioned a mahogany article plaque from In The News. This marvelous wooden plaque will preserve Carlos' article for future generations of his family. Carlos' tale is one of perseverance in the face of adversity, and how it is important to never give up when life gives you a challenge. When Carlos' children, and eventually their children, read the story of Carlos' life, they can be inspired by how his refusal to quit helped him find happiness and plenty, and maybe even learn from his example. Carlos' plaque, like any In The News plaque, will keep his story in pristine condition for generations. The timeless wood finish gives Carlos' story a classic appearance fit for an heirloom trophy, but will still look at home in the office. If you would like to contact Deborah Goebel, a Senior Account Executive at In The News who helped Mr. Capdevila with his order, you can call her at 1-800-548-3993 Ext. 3031, or you can email her at debgoebel@inthenewsonline.com.